Nearly every recipe on my blog is my true creation; but once in a while I do find inspiration from someone else's recipe. I saw a version of this soup on a show...honestly I'm not sure which one. So this is an adaptation of that - if anyone has seen which show this is, do let me know and I'll credit it! 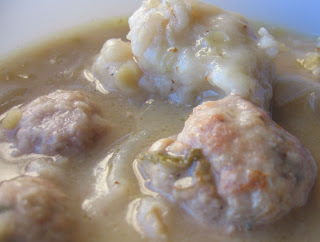 The mustard in the dumplings of this soup carry over and flavor the rest of the soup- it's hearty, tasty and an unexpected flavor. The hint of horseradish gives a zip as well. 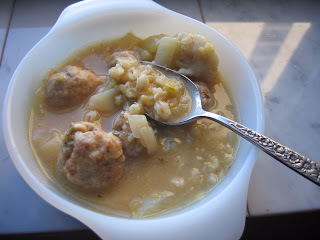 My meatballs are wonderfully tasty and could be used in other recipes as well. It does take some time to roll out and brown them, but it's worth the time. 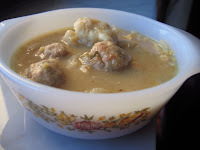 This a manly soup- make it for your men today and watch them be fat and happy! let that simmer while you make the dumplings. Lightly spread flour on a large, flat plate. Roll the meatballs lightly in the flour and then lightly brown. Don't cook all the way through, because these will finish cooking in the soup. Stir to incorporate all ingredients; drop teaspoons full into the simmering pot. You'll just need to push the dumplings down into the broth, they will reduce in size as they cook. Cover and let simmer for about 1/2 hour. Serve.